USA Today NFL writer Jarrett Bell has reported that Kansas City Chiefs head coach Andy Reid fears that star safety Eric Berry suffered a torn Achilles during the NFL curtain raiser against the New England Patriots on Thursday night. Prior to the injury, suffered in the fourth quarter, Berry had put together a strong performance with a PFF overall grade of 86.5, which included limiting Patriots TE Rob Gronkowski to just two catches for 33 yards on four targets and also two stops in the run game. 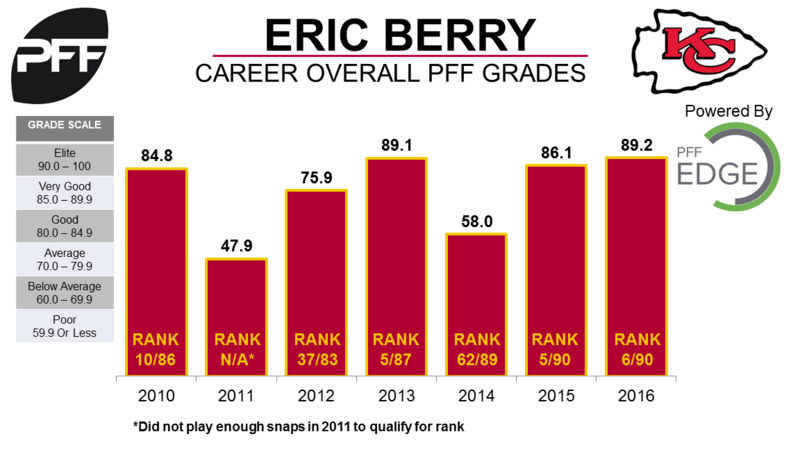 Berry signed a six-year contract extension in February worth up to $78M on the back of a 2016 season in which he posted an overall grade of 89.2, the best of his career to date, which ranked sixth out of 90 qualifying safeties. In the last two seasons, Berry has been on the field on for 96.1 percent of the Chiefs defensive snaps during the regular season and been particularly strong in coverage with his 2016 yards per coverage snap total of 0.31 (the amount of yards a safety allows whilst in primary coverage relative to how many snaps he is in coverage) ranked eighth out of 56 safeties playing in more than 50 percent of defensive snaps.